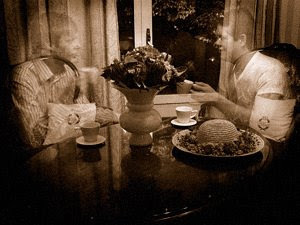 All these ghost talks triggered Davids imagination which lead to experiments with long exposures. We used 2 sets of coffee cups. One was always on the table, the other we held in hands and took with us when leaving the frame. Well, D and myself had a good time.